The first night we had the perfect view of a fireworks show off of the SkyCity tower outside the window of our beautiful, modern airbnb apartment. It was a great start to an amazing once in a lifetime trip. First thing you should know about traveling down under is that it helps to know a local who is comfortable driving you around on the wrong side of the road. I was barely capable of crossing the street without being killed. Shane brought us to the very hip Ponsonby Road for delicious meals and shopping, to the duck ponds (which had eels), the War Memorial Museum, and the beautiful Winter Gardens. We also went hiking on Mount Eden’s volcanic crater and had cocktails at the beach. Also, a big thank you to Shane’s sister Michelle for having us over for a BBQ at her house, and to his mom for helping us with airport transportation at ridiculously early hours. I love accents, so I was in heaven. An ad on the radio kept telling me to, “Wake up to a bitter day!” It always made me laugh because if I did that, I’d be like many gays I know who I shall not mention in this post. I also learned that a ‘sweater’ is called a ‘jumper,’ which sounds like baby clothes. One of my favorite days was spent on Waiheke Island. We took a ferry and had lunch with some of Shane’s friends at the Oyster Inn and then went to the beach. This was followed by wine tasting at Cable Bay Vineyards where they served us delicious wines and tapas on a cliff overlooking the sea. It was unbelievably beautiful and drunkenly relaxing. 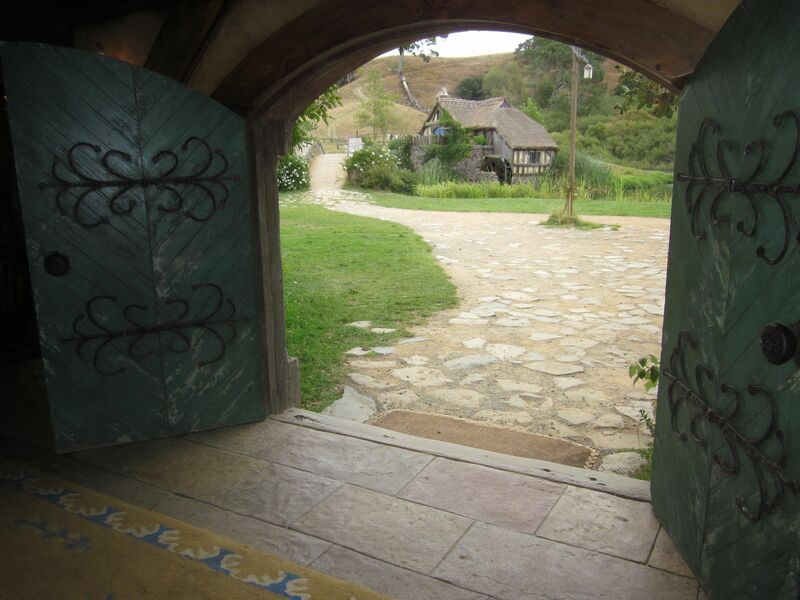 We also spent a day in Hobbiton, a working sheep farm where they filmed the Hobbit movies. Shane works for Warner Brothers and arranged free tours of the set locations for us. I’m not a fan of the dungeons and dragons, but any fan of movie making would appreciate the gorgeous world they created. The magical village in the shire is alive with beautiful flowers and butterflies, all quite real. We were also in Auckland for their gay pride. I should mention that the gay bars in town are only open on Fridays and Saturdays, because apparently the New Zealand gays don’t drink on weekdays. This makes the city unlivable, but I digress. We met up with our flight attendant friends Juan and Marche (aka Cherry Sundae) for some pride fun. Friday night we went with a bunch of friends to an outdoor movie screening of Some Like it Hot projected on the silos of an old shipping yard. Saturday we went to a house party, a parade, and an outdoor dance party—not bad for a bunch of tourists! This entry was posted in Uncategorized and tagged Auckland, gay pride, Hobbiton, New Zealand, Ponsonby by billylambrinides. Bookmark the permalink.